Politicians rapidly become accustomed to being pilloried as a matter of course by sizeable numbers of the population. Their customary ranking in the trustworthiness stakes alongside second-hand car salesmen and real estate agents is the penalty they must pay for putting themselves out there and having their thoughts, words and actions publicly judged on a daily basis. My own experience, paradoxically, is that while politicians as a class are slated, individual politicians are often treated – on those many occasions when they meet the public – with exaggerated respect. But it remains the case that many politicians seem to try with some success to give their profession a bad name. Politicians face two kinds of moral hazard; on the one hand, they face the same tests as the rest of us in meeting the standards that are normally required of everyone in their interaction with each other; but in addition they are required to make the correct responses to the demands that arise from the particular and public responsibilities they must discharge. First, then, politicians cannot – or at least should not – seek any form of dispensation from the ordinary ethical requirements of honesty and straight dealing that are required of everyone in their normal dealings with others. There is nevertheless a temptation in some quarters – and it is a temptation to which some politicians fall victim – to believe that the assertion that “all’s fair in love and war” can be extended to politics. I have never accepted that lying and cheating are acceptable because “it’s just politics”. If anything, the normal standards of behaviour should be higher for those who claim that they should be trusted with the power to make important decisions on behalf of all citizens. Secondly, politicians also face the additional burden of ensuring that they use their special powers and responsibilities to the advantage of their constituents and not their own. These matters are not always easy to judge or regulate, and can often depend on culturally different assessments of what is or is not acceptable. In my years as a British MP, I lost count of the number of times on which, in return for help that I felt it my duty to give, I would be offered a gift (sometimes quite valuable) by a constituent – often from another culture – and have to explain politely that I could not accept it. But there are of course those politicians who are less concerned with such niceties – and that way lie “pork barrel” politics and corruption. New Zealand is consistently rated as one of the countries where such behaviour is least prevalent. But we should be alert to instances where one or other or both of these moral traps seems to have ensnared one of our politicians, which is why the John Banks affair should ring alarm bells. There are two aspects of the case that worry me but which have attracted little attention so far. First, we are told, in Kim Dotcom’s sworn evidence, that he was asked by John Banks for anonymous donations because that would allow him to “help” Dotcom more effectively. This seems perilously close to an overt proposition that the mayoral candidate was willing to use his power, if elected, to offer differential “help” to a particular interest, and that this exercise would be aided if the financial help being solicited could be kept secret. I am surprised that so few seem to have grasped the unacceptable nature of this proposed arrangement. The sale of favours by politicians should be anathema to any system of fair and open democracy. The second issue is a mystery at the heart of the Prime Minister’s continued defence of his ministerial colleague. Whatever one may think of John Banks, there will be surprise that the Prime Minister has maintained such indifference to the compelling evidence that his minister was less than truthful in his treatment of supposedly “anonymous” donations. The explanation usually offered for the “see no evil” stance by the Prime Minister is that he needs John Banks’ vote if he is to get his legislation through the House. But this doesn’t wash. John Key could easily dismiss Banks from his government and avoid further damage to his own standing without jeopardising his wafer-thin parliamentary majority; Banks would still be an MP and able to vote for the government’s legislation. The fact that the Prime Minister has not taken this obvious course suggests strongly that there is an element in the situation of which we are not aware. That element can only be an implied threat from John Banks, along the lines of “as a minister, I’m obliged to vote for the government, but if I were reduced to the back benches, I could not guarantee to support any particular piece of legislation”. If this is the case, as I think it must be, John Banks has compounded his slipperiness with the truth by, in effect, making an implied threat to the Prime Minister. We must hope that, in the interests of good government, the Prime Minister will have the courage to call his bluff. This article was published in the NZ Herald on 24 September 2012. The G20 summit seems certain to demonstrate that for most world leaders the conversion to Keynesian economics is no more than skin-deep. The global crisis may have compelled some re-assessment of the “free” market doctrines previously thought to be unchallengeable, but many of those attending the summit are reluctant to accept the responsibilities that a Keynesian approach would require of them. It is worth rehearsing therefore what the global recession now demands of governments if we are to avoid a further plunge into full-scale depression. Like so much of Keynes’ approach, the prescription rests on common sense rather than ideological prejudice or mathematical models. The key feature of a recession is a shortage of demand or purchasing power in the economy. The danger is that, once that condition applies, it feeds upon itself. Despite the urgings of politicians, individual actors in the economy – both in their personal lives and in their businesses – understand that times are hard and that the economy is flat or shrinking, and they act accordingly in their own self-interest. They cut their personal spending and their business costs. They employ fewer people and they invest less. Their concern is entirely for their individual or family or business interests. They cannot be criticised for this. Their behaviour is entirely rational. The problem is that the sum total of all these individual decisions is that the economy shrinks further – a kind of multiplier in reverse. An economy left to resolve this for itself will take a long and damaging time to come right. If the process is to be short-circuited, and depression is to be avoided, there is only one agency that is capable of taking effective action. That agency is the government. Only governments have the capability and the duty to act in the wider interest, to take decisions that would be directly contrary to their self-interest if they were individuals or businesses, and to act consciously to defy market logic by spending when others can and will not. Governments can afford to do this, if they choose, because their ability to borrow to fund investment for the future is – by the standards of any other agency – virtually unlimited, and their responsibility is not to particular economic actors, like banks or shopkeepers, but to the economy as a whole. They alone can afford to take a long view – long enough to live with a growing deficit while the economy regains its buoyancy. It is governments in the end, not banks, who are the funders of last resort. If there was ever any doubt about this, it must surely have been put to rest by the collapse of the banks in most parts of the world, and the taxpayer-funded bail-outs that governments have had to organise. Why, then, are political leaders still so reluctant to recognise that is they, not the banks, who must provide the kind of stimulus to spending that is needed if we are to turn the recession round? The reason is that they are still prisoners of the same intellectual straitjacket that created the crisis in the first place. 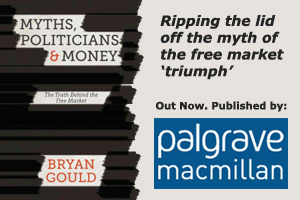 Despite all the evidence to the contrary, they are still convinced that the major decisions in the economy should be taken by banks – or the private sector more generally – rather than governments. Even when they have spent billions on bail-outs, and the billions have disappeared into the banks’ balance sheets, they still somehow expect that the banks’ self-interested pursuit of their shareholders’ interests will revive the economy as a whole. Old habits die hard. Privately owned banks have been allowed to develop a virtual monopoly of credit creation for more than 200 years. It is such a familiar feature of our landscape that it has been scarcely remarked, even when bank credit became by far the most significant element in the rapid growth of the money supply – and therefore the greatest factor in inflation. The banks’ impact on monetary policy – and the exclusive focus on that monetary policy – was itself a huge abdication of responsibility in favour of private interests. But just to make absolutely sure that the banks would not only monopolise credit creation but would also control monetary policy itself, governments surrendered the task they had been elected to fulfil by handing monetary policy over to an “independent” central bank. Our politicians are still at it. We are told that we must give the banks some “breathing space”. That is after they have walked away with billions of our money. It does not seem to have occurred to our political leaders that it was not the interests of bank shareholders and the survival of banks as institutions that mattered. The focus of policy should have been, first, the security of deposits, and secondly, a re-thinking of whether the banking function should remain a private monopoly or should be seen properly as a public responsibility – as, de facto, it has become. If governments – for which read us – have had to put up the money, why should we not call the shots? As the true scale and nature of the global crisis becomes apparent, the blame game is under way with a vengeance. Not surprisingly, those who find that it is their jobs and homes that are now at risk are keen to identify those who can be held responsible. It isn’t just those – like Bernard Madoff – who have now been unmasked as criminal fraudsters that they have in mind. They want to dig deeper for answers to the question reportedly put by the Queen – why did no one see it coming? Politicians, as usual and with some justice, are the first in the firing line. Even those, like the British Prime Minister, Gordon Brown, who have apparently experienced an overnight conversion to policies they had scorned for 25 years, do not seem to have earned forgiveness for their recantation. And If George W. Bush were still in office, one shudders to think how low his already abysmal approval rating would have fallen by now. Internationally, much of the anger felt by ordinary citizens is of course directed at the banks and at the unbelievable stupidity and greed shown by senior executives who are still paying themselves huge bonuses and pensions at the same time as receiving billions of taxpayer dollars to save their institutions from bankruptcy. Economists, too, or at least some of them, are being held accountable for propagating and endorsing doctrines which even Alan Greenspan now says were fatally flawed. Accountants who failed to audit, and lawyers who turned blind eyes, also come in for their share of bitter criticism. One group, however, who have so far escaped relatively unscathed are the media. In a democracy, as the media themselves frequently tell us, we should be able to rely on reporters and commentators to ferret out wrongdoing and to warn about unsafe and destructive policies and practices. So, where were the media over thirty years, while the excesses and stupidities of an unregulated market moved to their inevitable conclusion? There have been honourable exceptions, of course, but the media have too often been the loudest voices in support of the whole ramshackle structure of greed and irresponsibility that has now come crashing down. We can only conclude that they have been so keen to promote their own prejudices – or at least those of their owners – that they have allowed judgment to fly out the window. One of the most prominent cheerleaders has been The Economist – a weekly journal enjoying an enviable reputation for sound judgment and insightful commentary. Yet, for The Economist, no reward has been too great, no excess too outrageous, as long as it was ordained by the “free” market. The broadcast media have been just as bad. CNBC, a business channel claiming to be the only channel “with the information and experience you need”, has gone one better – or worse. Its so-called “experts” advised investors to trust – in turn – Bear Stearns, Lehman Brothers, and General Motors just weeks and months before they demanded billions from taxpayers as the price for staying afloat. Little wonder that, with “expert” advice like this, the ordinary investor was led astray. But the failure of the media was more often of the “head-in-the-sand” variety, offering assurance that the authorities had everything under control. Add to that the constant treatment of the rich as demi-gods who could do no wrong and we can begin to see the responsibility that the media must bear for the failure to sound the alarm. And they are still at it. We were treated a week ago to an article in the Asian edition of The Wall Street Journal, reporting an interview with our Prime Minister, John Key, conducted by one Mary Kissell. Ms Kissell was given generous air-time by our broadcast media and was widely reported in our press. The Prime Minister cannot be held responsible for the views of his interviewer but he may have jibbed a little at the cold water she poured on the efforts made by governments around the world to restore a broken financial system and to help the global economy re-establish a level of demand that had dropped like a stone. The value of Ms Kissell’s views may be judged by the potted history she gave her readers of New Zealand’s recent economic history. Our “island nation”, we were told, “grew smartly” following the “reforms” of Rogernomics. Growth had, however, stagnated in the last nine years when “free” market policies were not maintained. Even a cursory examination of our GDP statistics would reveal what a gross misrepresentation this is. New Zealand GDP growth was virtually non-existent in the seven years following 1984, and reached its highest sustained level from 1999 to 2008. Where were the New Zealand commentators who could surely have pointed this out, and judged the Wall Street Journal article for what it was – a piece of special pleading by a mouthpiece for institutions that had been thoroughly discredited by recent events?